To understand the true character or nature of something. To provide support or cooperation to a person throughout a period of time. To work on a project until completion. We offer you support in your projects to redefine your strategy, identify and develop your key resources, find solutions adapted to the challenges of digitalization and human capital management, optimize your procedures and transform your business perspectives. We hence offer integrated solutions covering a wide range of services. Our missions, our reasons for existing are as follows: advising, supporting, providing tools, optimized procedures and methods for improving performance, administering the processes that are delegated to us, ensuring compliance, training and informing. Our vision consists of the goals we pursue in order to achieve the best of our missions. It consists of four strategic axes: Excelling for our clients, leading complex projects based on efficient and innovative management methodologies and techniques, humanizing performance, staying at the forefront of new technologies. Thanks to our experience in conducting complex projects in companies of all sizes and all types of sectors, we are able to quickly understand your needs and offer you pragmatic solutions whose effectiveness is measured at each stage of the projects. Each intervention is preceded by a free preliminary assessment. Our quality commitment continues after the implementation of the recommended solutions in order to measure their effectiveness over time. Transparency, trust and ethics in relationships are the factors for the success of all projects. 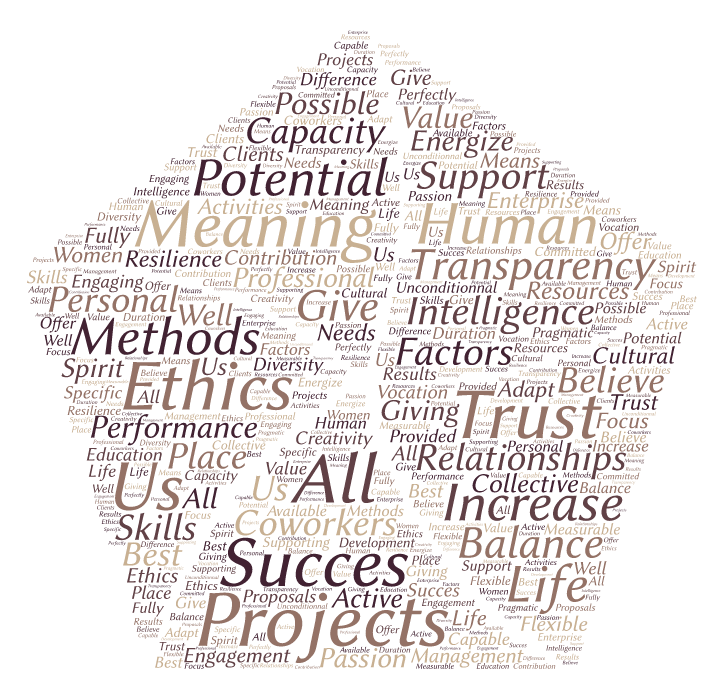 We strongly believe in human-centered management methods. We believe that it is possible to boost collective intelligence and increase employees' engagement and performance by making the contributions they bring to the life of the company meaningful. We give particular importance to skills that are too often relegated to a secondary plan when identifying high-potential resources such as resilience, passion and ability to give purpose to professional activities. We value difference, cultural diversity, creativity and entrepreneurial spirit. We are committed to develop staff unconditionally and to the decrease its turnover. We are active in the areas of education and vocational guidance and support projects promoting a better balance between working and personal life, as well as supporting working women. We strive to offer pragmatic and flexible proposals that can adapt perfectly to the specific needs of our clients. We focus on both the means provided and the measurable results achieved over time. We remain available and fully committed in all the projects we drive. Our team consists of multilingual consultants with many years of experience in various industries. They are graduates in business management or human resources and are certified or patented in their fields. We work with the support of an extensive network of experts in order to better accompany you in the conduct of complex projects requiring specific high-end skills.